QUEBEC – Toronto’s Troilus Gold Corp. is launching a 40,000-metre drill program at its 100% owned Troilus gold property near Chibougamau. Two phases are planned to de-risk and expand on the current resource report last November. Last year Troilus offered a resource estimate for both open pit and underground mineralization. There were 121.7 million indicated tonnes averaging 0.87 g/t gold and 0.086% copper, containing 3.4 million oz. of gold and 231.8 million contained lb. of copper. The inferred estimate was 36.1 million tonnes grading 0.88 g/t gold and 0.083% copper, containing 1.0 oz. of gold and 66.2 million lb. of copper. 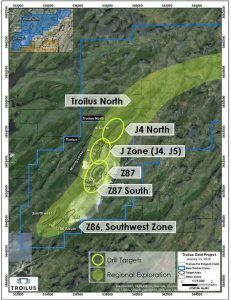 Half of this year’s drilling will be done on the J zone target, 25% at Z87 South, 15% at Z87, and 10% at J4 North. Property scale exploration will be done to follow up on strong results from sampling and historic drilling, on new property acquired on trend known zones, and to validate geological interpretations. The former Troilus mine produced 2 million oz. of gold and 70,000 tonnes of copper. Please visit www.TroilusGold.com.